Please meet our very own princess Leah! Leah sometimes prefers to go by her nickname, KC. Leah loves to do her makeup and dress in girlie clothes, just like a princess. She enjoys getting her nails and hair done and being pampered. Leah also loves to learn and is very smart. She aspires to go to college and is still trying to nail down her area of study. 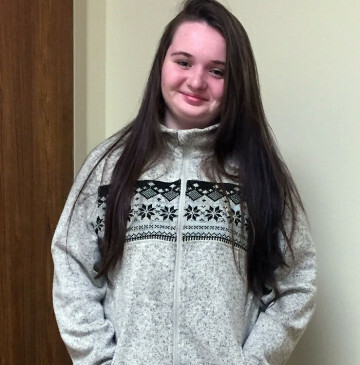 Leah has been interested in veterinary science, social sciences, and art. She loves to read and write poetry. Leah is very artistic and creative and loves to think outside of the box. She can struggle with social interactions in large groups of people, at times. Leah does very well in small groups and has a kind heart for the underdogs; she reaches out to them and tries to lift them up. Leah's family will be a small family where she is the only child or one of only a few children. Leah's family will also help her to find her place and identity in this world and assist her in finding her own unique lifestyle. Leah will be the most successful when she feels that her family accepts her for who she is and loves her even more for her uniqueness. Leah's forever parents will also have strong knowledge of the education and supportive services to be able to locate the best services for Leah so she can achieve her goals. Leah's forever family will also be patient while she learns the rules of her new family and she settles into her new role within that family.